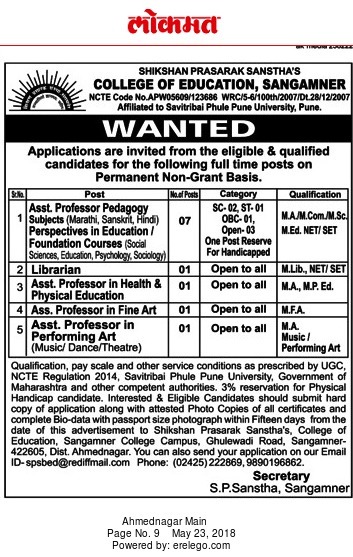 Shikshan Prasarak Sanstha's College of Education, Sangamner has advertised in LOKMAT newspaper for the recruitment of Assistant Professor job vacancies. Interested and eligible job aspirants are requested to apply with in 15 days. Check out further more details below. About College: Shikshan Prasarak Santha’s College of Education, Ghulewadi, Sangamner is proud to be an integral part of this picturesque Educational Complex at Sangamner College Campus. The college of education for Marathi Medium was established in the year 2007 approved by NCTE Bhopal, affiliated to the University of Pune with an intake capacity of 100.